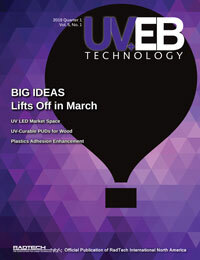 As the use of ultraviolet and electron beam (UV/EB) processes continues to grow and new applications arise, traditional manufacturing firms are customizing their equipment for these fast-emerging technologies. Crucial product and service providers in such areas as fluid delivery, robotics, application equipment, conveyance, controls, testing, inspection, systems integration, and health and safety are increasingly finding their customers moving to UV/EB platforms. To support their efforts to address these new market opportunities, RadTech has started an Applications Support Committee. For more information on the new committee, visit www.radtech.org or contact RadTech at uveb@radtech.org.